Bloomberg's raid on Occupy Wall Street was, above all, a cowardly act. But Occupy will live on with or without Liberty Square. The raid of Occupy Wall Street by the NYPD did not come as a complete surprise. Ever since Mayor Bloomberg and the owners of Liberty Square, Brookfield Properties, threatened to toss out the Occupation on October 14 under the pretext of sanitary concerns, organizers have been preparing for this moment—canvassing other sites and drafting legal arguments defending the people’s freedom of assembly. But still, the military-style incursion into Liberty shortly after 1 am on November 15 came with a brutality and premeditation that literally took the Occupiers’ breath away. Given just minutes to vacate, protesters who peacefully resisted—as well as those who were just slow to act—were pepper-sprayed, beaten with billy clubs, shoved, cuffed and tear-gassed. In the end, around 200 were arrested, including City Councilman Ydanis Rodriguez, who was bloodied by a strike to the head. Along with sleeping bags and tents, the Occupation’s intellectual tools—laptops, posters and the 5,000 books in the People’s Library—were thrown into dumpsters and carted away. But the ideas contained in those books, in those computers, in the Occupiers themselves will not so easily be tossed aside. The eviction was, above all, a cowardly act, done under the cover of darkness and an attempted media blackout. Before the raid began, the city shut down the Brooklyn Bridge and local subways, preventing allies from rallying to the square, and as the raid unfolded, police kettled, roughed up and arrested journalists and pushed them farther and farther from the action. News helicopters were banned from downtown airspace, and some local residents were forced to stay indoors, preventing them from snapping photos and bearing witness. All of which raises the question: If Mayor Bloomberg was really acting in the interests of the Occupation’s health and safety, if he was really moved by civic concerns—arguments he made at a press conference—why sneak around like a thief in the night? What exactly is Bloomberg afraid of? Despite the mayor’s lip service to the protesters’ right to express their grievances, the raid on Liberty was not just an attack on the physical space taken up by the Occupation; it was an assault on what that space has come to symbolize: the exercise of democratic dissent and the yearning for a more equitable, more just society. Especially now, nobody represents the opposite of those ideals more than New York City’s billionaire mayor, who bought his third term and whose respect for free speech extends only to the point where the interests of the class he represents are truly threatened. Alas, Bloomberg is not alone: progressive mayors in Portland, Oakland and Salt Lake City also authorized sweeps of Occupations in their cities over the past few days, perhaps acting in concert after a recent conference call between officials from eighteen Occupied cities. Now, in the wake of a court ruling upholding Brookfield’s ban on camping and other equipment, Occupiers are debating their next move. In the meantime, they are planning a citywide rally on November 17, announced before the raid, to “shut down Wall Street.” If Mayor Bloomberg hoped to chill this protest with his midnight assault, then the outpouring of support in New York and nationwide has only proven his tactic a disastrous miscalculation. Indeed, some are calling the mayor’s action an unintended gift. There’s no doubt police aggression has spawned public sympathy for Occupy from its inception, but to suggest that its staying power rests on such a narrow foundation is to sell it short. 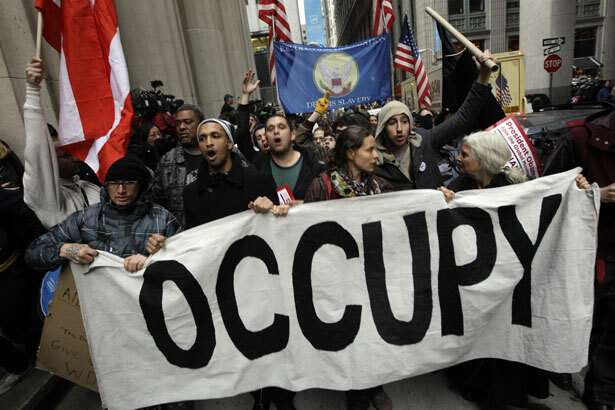 A movement for the 99 percent, after all, was always too big for Zuccotti Park.